Pakistan cricket team was in New Zealand few days ago due to attend a dual competition against New Zealand. But this time, they had to wait till long time to get their first victory. They faced the ODI series defeat against Black Caps and later, the opening T20I match was also defeat. So, they were desperate to win the next matches. As a result, Pakistan managed 1st victory against Black Caps in 2nd T20I. The match was important for the Green Army and if they failed to win it, New Zealand could secure the T20I series as well. It was pathetic for Pakistan that they faced whitewashed in ODI series where they played five matches but failed to manage at least one victory. Though, at the beginning of the tour they won the warm up match and their confidence were high enough. It was all failed finally. Now let’s discuss about their first victory though it was the 2nd T20I match. 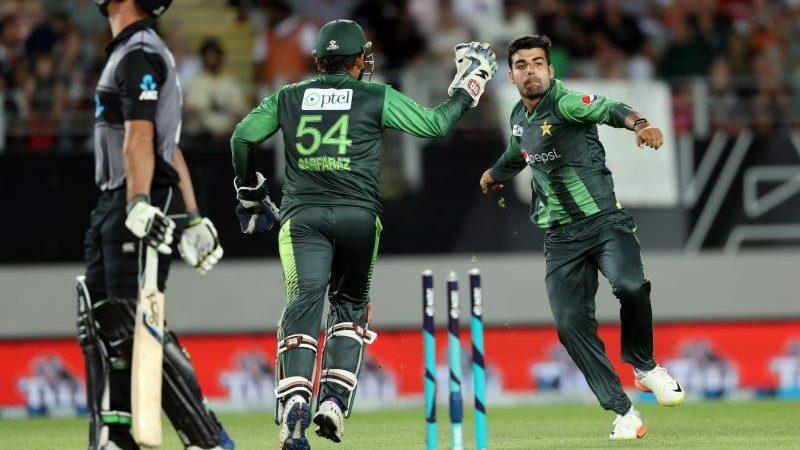 The match between Black Caps and the Green Army was taken place in 25th January, 2018 which was staged at Eden Park, Auckland. The competition was day/ night as usual. Team Pakistan won the toss in the match and opted to bat first. So, Black Caps came to bowl but in that day, their bowlers failed to dominate the batsmen but were dominated by them. Pakistan simply destroyed Black Caps bowlers and presented a big score in front of the local team. Babar Azam scored highest 50 runs in just 29 balls and remain not out. Pakistan finished their innings scoring 201 runs in just 20 novers. They lost only four wickets to do that score. The day was for them it seems. Ben Wheeler took only two wickets for Black Caps. However, to face such big score Black Caps started their innings well but they faced their batting disaster. Though they tried to chase the score but it was too big. In 18.3 overs team New Zealand lost all wickets and finished their innings scoring 153 runs so far. Mitchell Santner scored highest 37 runs by facing 28 balls for New Zealand. On the other side, Faheem Ashraf took three wickets for the Shaheens in exchange for 22 runs. At the end, Fakhar Zaman was announced as the player of the match from Pakistan team. Now, both teams will look forward their last meeting and through that the winner of the T20I series will be decided.